Vista Townhouse Apartments - 912 SW Vista Ave. 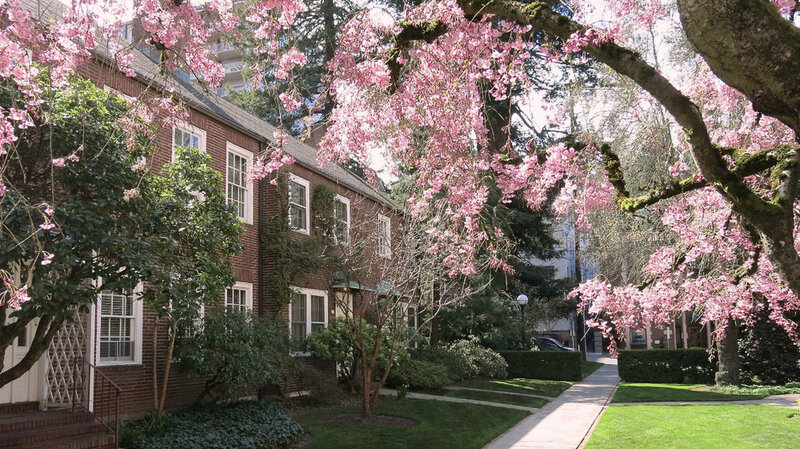 This townhouse apartment building is right next door to the Belluschi building we profiled in our last case study. It consists of two back-to-back U-shaped courtyard buildings, with an unusual arched below-grade connection to the back courtyard, which is located about 10 feet below sidewalk grade. The site slopes away from Vista Ave, allowing this unique configuration. The units are two bedroom, two story townhouses, averaging about 720 square feet. There are 22 total units; 10 townhomes in each courtyard, and two basement flats (they are daylight basements, made possible by the sloping site). The building is tastefully rendered in the Euro-eclectic vernacular that was popular in the 1920s, with a brick base, stucco upper floor, clay tile mansard (the primary roof is flat) and leaded glass windows. Our only complaint about this design is that due to the aspect ratio of the courtyards and the large trees that fill them, the units are rather dark. Vista Avenue Apartments: 800-864 SW Vista Ave. This apartment project was designed by Portland’s best known 20th century architect Pietro Belluschi. The project is situated on a large parcel (measuring 200’ x 300’) in the Goose Hollow neighborhood. The site consists of seven residential buildings and four detached garage structures arranged around a central courtyard. There are 30 townhouse units, 12 stacked flats. The latter are divided between the three largest buildings, and located at the middle of each bar. The flats are in groups of four arranged around a shared stair lobby, and flanked by townhouse units on either side. The site slopes away from the street and from the north side to the south side, which creates novel and picturesque conditions, belying the symmetry of the plan. The buildings to the north site lower than their southern counterparts, creating an impression of asymmetry. 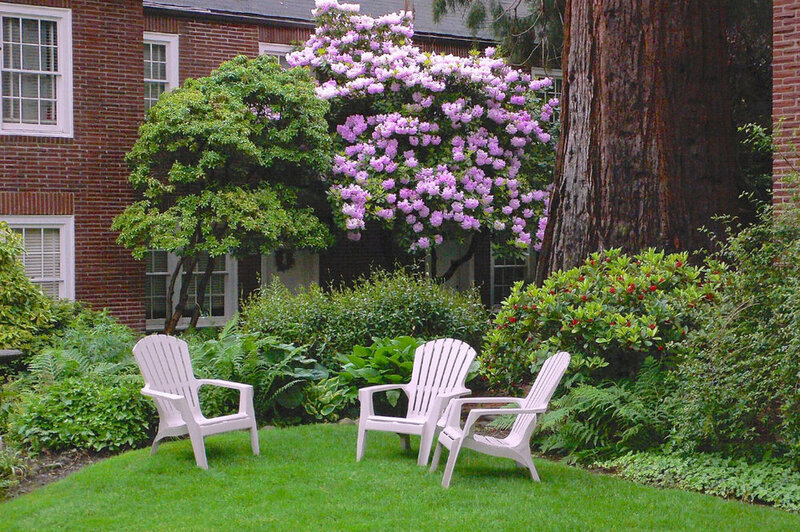 This is enhanced by landscaping, which includes both lawns and intimate seating areas, and several very large sequoias and rhododendrons. All the townhouse units feature private basements and many have working fireplaces. Additionally, garages are kept out of sight. 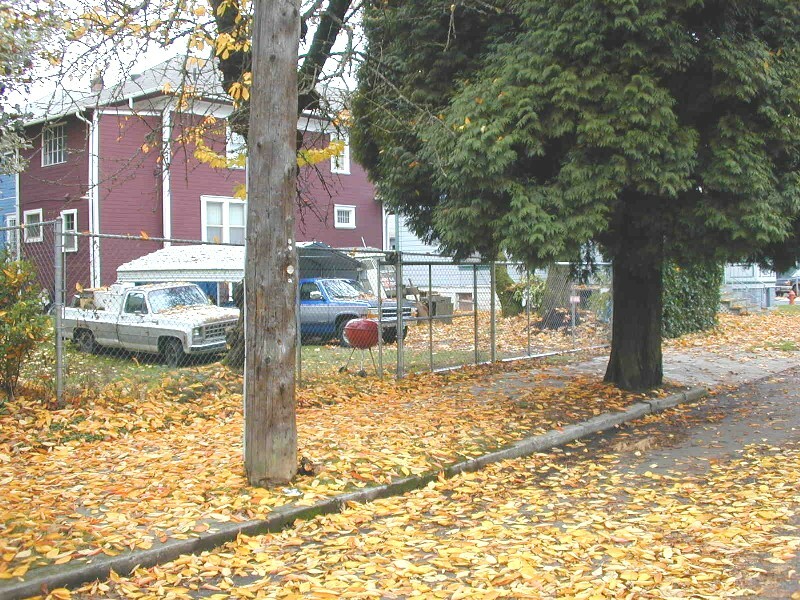 Rows of garages sit behind the buildings that flank the courtyard, and orient toward drives (the northern one is a stub street and the southern is a private driveway. Their impact on the site is minimized by depressing them such that the garage roofs are roughly level with the ground plane on which the buildings’ main levels sit. Another row of garages is located in the basement of the longest building which lines the back of the site. The garages face SW St. Claire Ave.
Street view rear, SW Yamhill & St. Claire. Just west of Ladd’s Addition, we discovered this fascinating recent addition to the neighborhood. This little project shows what a little attention to proportion and form can do. This building takes a form common to pre-war multifamily housing, a U-shaped building with to wings and an entry court. Unlike a typical apartment building in this format, this project is a somewhat unorthodox configuration; six three-story townhouses. The façade material is the mundane material, EIFS, a foam and stucco cladding system we typically associate with suburban strip malls. Here it’s used to great effect, including a nice offset around the windows, giving them a depth not usually found in contemporary construction. We located a great precedent about a block away, showing historic context for this design. We particularly appreciate this building because of its sensitivity to its surroundings and its careful application of classical proportions. While composed in the form of a well-established typology, the building also exhibits a clear hierarchy of base middle and top. It is symmetrically composed, and its windows are roughly twice as high as they are wide. On the block face, the building’s cornice is roughly in line with the roof heights of surrounding structures. 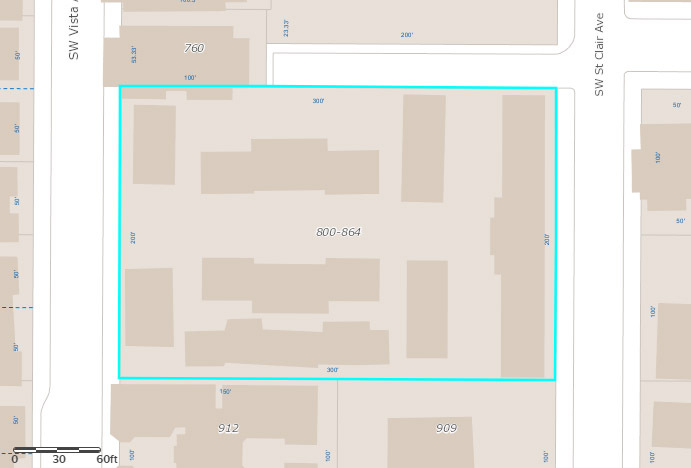 The building achieves a very high net density because it is on a very small lot. 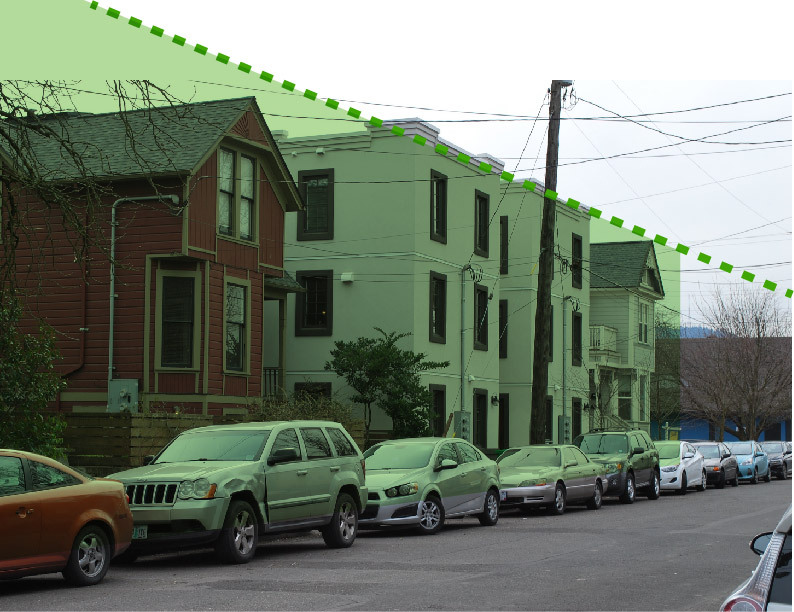 At roughly 50x57, the lot is about half the size of a standard Portland residential parcel. We uncovered a “before” photo from the City, showing the property before this building was constructed. The lot appears to have been chiseled off from a neighboring property, creating a new half-lot. Nice window detail, unfortunate PGE meter placement. Height: 2 stories, 25’ approx. 2413-2417 SE Division provides a lovely modern example for a traditional two story row house similar to what you would find in historic English and northeastern U.S. neighborhoods. Unlike many of its contemporary cousin townhouse designs, this building has been freed from the design constraints imposed by the addition of garages. This allows the structure to better blend into a neighborhood primarily constructed before the mass use of the automobile, and also allocates more street parking on a busy commercial corridor rather than limiting public parking due to curb cuts for private garages. 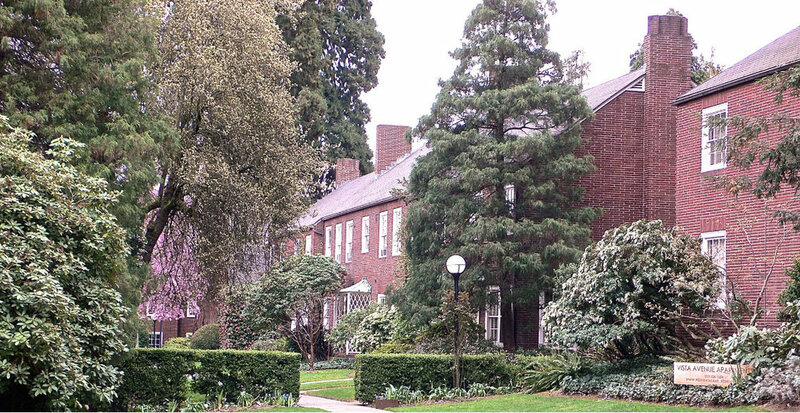 The project originated with the historical duplex located on the NE corner of SE 24th and Division, expanding to the neighboring lot with three forward facing townhouse units, with the later addition of two more townhouse units behind the first three. The living space of the units is not floating above a garage, allowing the living space to have a real relationship to the ground plane and the street. This relationship allows the building to blend into the existing fabric of the block - its sidewalks and other buildings, rather than floating 10 feet above everything else. Lots this close into the center of the city are well covered by public transit, and historically have not been designed around parking, this is a great place for garage-free design. Unlike many contemporary examples, this building does not fear symmetry and uses a tried and true approach to building design. You have simple clean lines creating clear definitions between the units, windows that line up, solid choice of quality build materials. We would love to see more of this in the future. 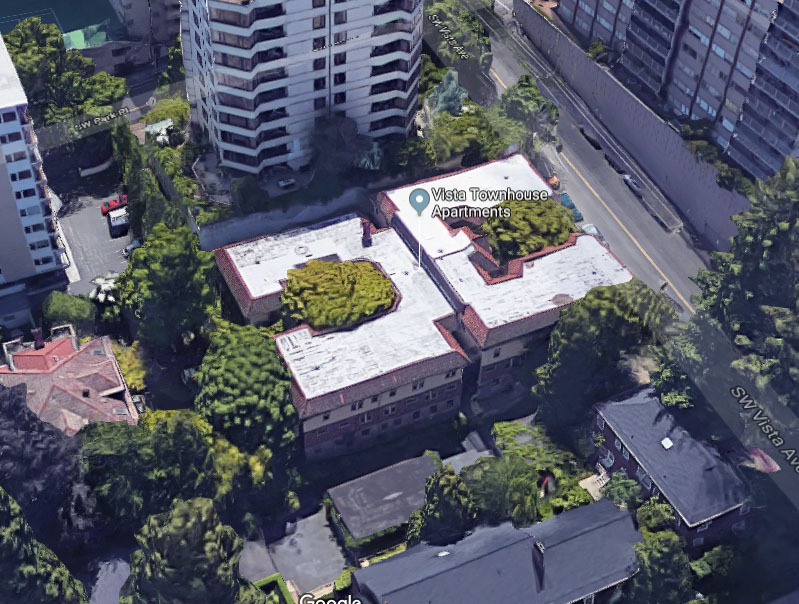 We’re going to call this odd but wonderful little building a “megacryptoplex” because like other cryptoplexes, it looks like a single family dwelling, yet it houses not two, but seven(!) separate dwelling units. 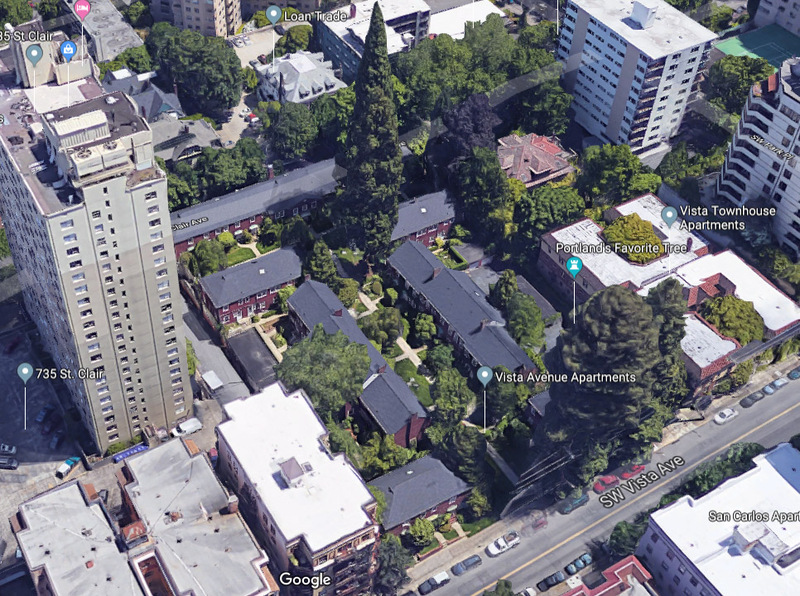 At a net density of nearly 61 du/ac, this building packs a lot of housing in a very unobtrusive, neighborhood scaled package. Moreover, it does so at a fairly low FAR of 0.7:1. Viewed from the street, the building presents as a one and a half story cottage. The front door provides access to two mirrored side-by-side units on the ground floor, while a stair leads to an attic unit. The other four units are reached from a friendly looking communal side yard. The building gets wider in steps, with the projections providing several street facing main entries to the back units. This axon view represents our best guess of the internal configuration of the building. It’s actually a testament to its subtle design that it is not readily apparent how the interior is partitioned when looking at the building from outside. In our experience, this building is unique in Portland. 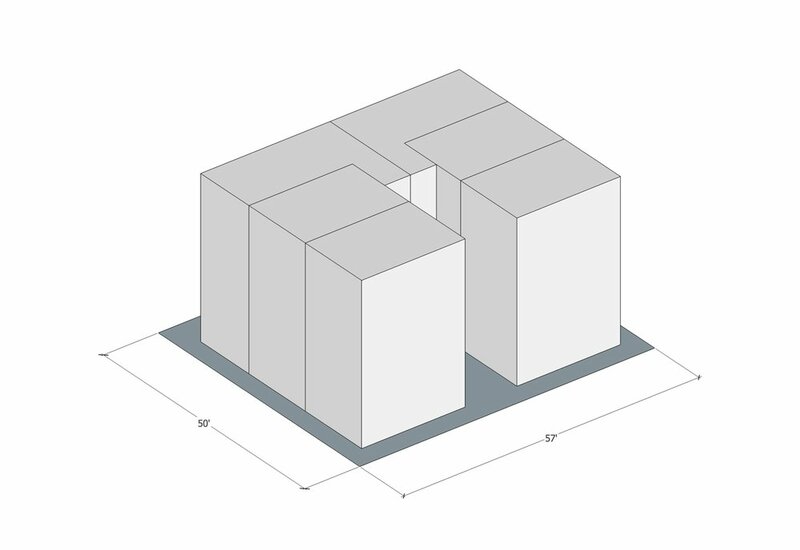 It most closely resembles a one-and-a-half wing courtyard segment, but even then, its stacked configuration has no analog in any other typology we have documented. This building exceeds the density in the R1 zone, but we can envision several code hacks in which it could legally be replicated. We were very excited to find this new building a block north of SE 12th and Clinton. 2701 SE Clinton is a 12 unit walk-up apartment building with four units per floor. It is an L-shaped building on a corner (double) lot with two wings parallel to the street sides. Access to upper units is provided by a shared stairway on the inside of the L, with exterior walkways leading to the upper units. 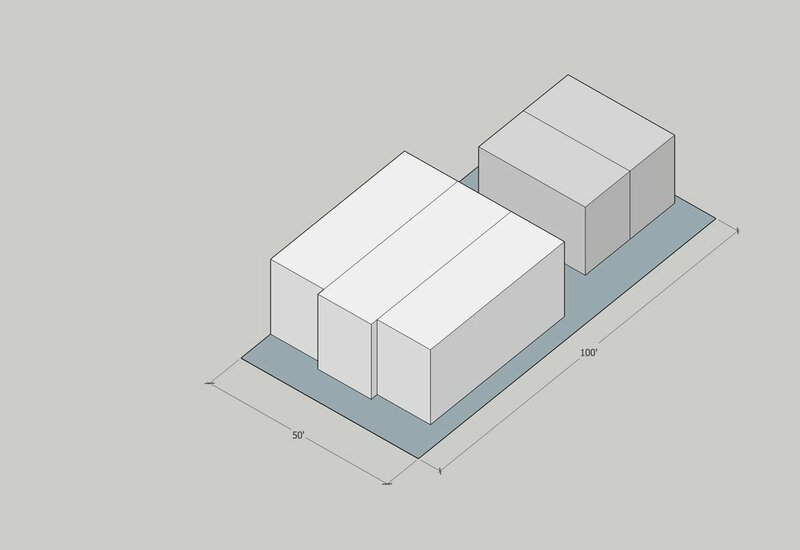 Because of this configuration, it is very efficient, with most of the building area used for units instead of circulation. Additionally, every unit has at least two exterior facing walls. End units have three. Architecturally, this is a terrific design, with clean rigorous symmetry, quality materials, intentional façade composition and a terrific relationship to the street. Ground floor units feature stoops and semi-private terraces. These are accommodated by a setback of approximately 8-10’ from the street lot lines. This sort of buffer is very valuable for making ground floor units tolerable by creating some privacy for occupants. Additionally, they integrate the building with its surroundings by mimicking the form and function of its neighbors. The project was designed by local architect Hillary Mackenzie.